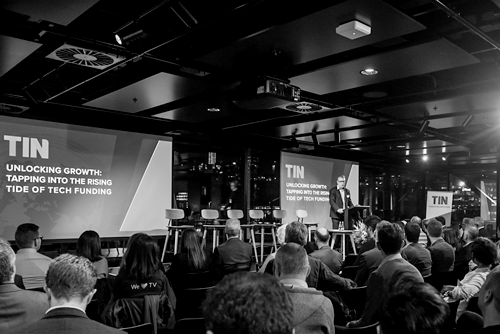 TINTalk Event Wrap Up – Unlocking Growth: Tapping into the Rising Tide of Tech Funding (24 May, Auckland). Around 130 people, many early stage tech entrepreneurs, gathered at Auckland’s Generator to hear a stellar panel of investors and tech executives share their thoughts on how to obtain investment. By way of introduction, MC Greg Shanahan introduced the latest findings from the 2018 Investor’s Guide to the New Zealand Technology Sector (download your free copy here). The guide highlighted how rising domestic funding in New Zealand’s early stage technology companies is creating more opportunities for follow-on investment from a growing number of international investors. The highly informative and candid panel discussion and audience Q&A sessions that followed featured tech leaders Douglas Paul (Nyriad), Dil Khosa (Parrot Analytics) and Miriana Lowrie (1Centre), along with experienced investors Chris Jagger (NZVIF), Alex Mercer (ArcAngels) and Bill Murphy (Enterprise Angels). A key theme of the discussion was that early stage technology companies need to communicate well and tell their stories passionately. Capital raising is a constant and ongoing focus for early stage companies and the ability of their executive teams to be “pitch perfect” and represent their brand well, evolve their message at every raise, stay focused and not deviate from their proposition, were key. Securing investors that could not just provide the money but also mentorship and customer networks was also considered to be highly important. To successfully compete against significant offshore competition with access to considerable capital, New Zealand’s tech entrepreneurs need to have a sense of urgency, a relentless drive to keep up with the pace of innovation, and the ability to remain optimistic in the face of steep competition.